UPDATE on 17 October 2014: The CBA drops plans to intervene at the Supreme court! POSTED on 9 October 2014: EJOLT has learned that the Canadian Bar Association plans to proceed with its intervention at the Supreme Court of Canada against Ecuadorean villagers. These villagers are trying to enforce a judgment from the Ecuadorean Court against Chevron for environmental pollution by a subsidiary. After an eight-year trial, an Ecuador court in 2011 found that Chevron had deliberately dumped billions of gallons of toxic waste into the rainforest when it operated hundreds of well sites from 1964 to 1992. The dumping caused a wave of cancers and other environmental problems that have decimated indigenous groups, according to the court decision. 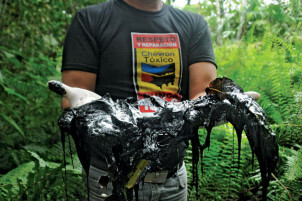 As Chevron has no more assets in Ecuador, the victims are trying to enforce the judgement in countries where Chevron has assets, such as Canada. This intervention by the Canadian Bar Association (CBA) is going ahead against the advice of the CBA’s legislation and law reform committee, against the advice from the national sections council, against its Aboriginal, resource and environmental law, and against civil litigation sections, among others. In defence of corporate interests, the CBA now finds itself on the wrong side of the courtroom, with Human Rights Watch and other important social justice organizations on the other side. EJOLT has written several times about this legal battle, has mapped this conflict in detail and supports the Ecuadorian organisations fighting for justice. This emblematic case is a perfect illustration of class justice on an global scale and it illustrates very well the sharp injustices that need to be addressed on an global scale. Feel free to register your disapproval with the National Board, who made this decision, and whose contact details are here: http://www.cba.org/CBA/about/board/default.aspx. Here is a letter from members of the Canadian Bar Association with dissenting views. Having been to Ecuador and seen some of the results of oil company destruction of local people’s environments, it leaves me incredulous that supposedly well-educated fellow Canadians would side with oil against grass-roots people trying to live in nature. These must be the same blood-sucking lawyers who back Harper’s eager attempts to bleed our country dry under the banner of progress–which means specifically the fat cats who fill their pockets at everyone else’s expense. We are all taking notes, so we can get true justice when the time comes. And it will!! The ethics of supporting a company that deliberately pollutes – to the extreme is reprehensible. I stayed in a coastal Ecuadorian village which was directly impacted by similar Chevron pollution. These subsistence villagers were paying 50% of their money to bring potable water into their village because a pipeline leak contaminated the aquifers in the area! I worked for Chevron , not in Ecquador tho.